Rep. Gary Palmer falsely claimed on a radio show that temperature data used to measure global climate change have been “falsified” and manipulated. Palmer, a Republican from Alabama, cited the so-called Climategate episode of five years ago, in which emails written by climate scientists purportedly showed evidence of data manipulation, and a more recent accusation of climate scientists tampering with data from temperature monitoring stations. 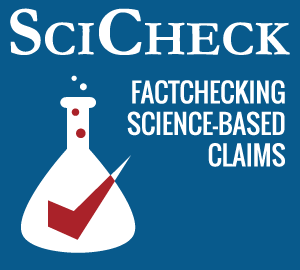 The Climategate scandal has been subject to several separate investigations, all of which exonerated all scientists involved from any wrongdoing, and the latest data manipulation charges are a mischaracterization of standard and well-validated methods for adjusting temperature records to eliminate factors that could produce inaccurate readings. Palmer, Feb. 10: I think it might be a matter of the report that came out last week about the government manipulating data and misleading people a little bit. But two feet of snow ought to get their attention. … It’s not the first time. I mean, I wrote about this a couple of years ago, when it came out that the scientists at East Anglia University in England had done this, and that was the data that the United Nations report was based on. It was a huge scandal, there were emails going around where they were, the scientists were literally talking about how they were going to change the data. We are building an entire agenda on falsified data that will have an enormous impact on the economy. The “report” to which Palmer referred was actually a series of blog posts, written by climate change denier Paul Homewood, which were then highly publicized in two stories by Christopher Booker in the Daily Telegraph in London. Both writers focused on the adjustments made to temperature readings at certain monitoring stations around the world, and claimed that those adjustments throw the entire science of global warming into question. This is not at all the case, and those adjustments are a normal and important part of climate science. Q: What are some of the temperature discrepancies you found in the climate record and how have you compensated for them? NOAA maintains about 1,500 monitoring stations, and accumulates data from more than a thousand other stations in countries around the world (many national and international organizations share this type of data freely). There are actually fewer monitoring stations today than there used to be; modern stations have better technology and are accessible in real time, unlike some older outposts no longer in use. The raw, unadjusted data from these stations is available from many sources, including the international collaboration known as the Global Historical Climatology Network and others. As the years go by, all those stations undergo various types of changes: This can include shifts in how monitoring is done, improvements in technology, or even just the addition or subtraction of nearby buildings. For example, a new building constructed next to a monitoring station could cast a shadow over a station, or change wind patterns, in such ways that could affect the readings. Also, the timing of temperature measurements has varied over time. And in the 1980s, most U.S. stations switched from liquid-in-glass to electronic resistance thermometers, which could both cool maximum temperature readings and warm minimum readings. Monitoring organizations like NOAA use data from other stations nearby to try and adjust for these types of issues, either raising or lowering the temperature readings for a given station. This is known as homogenization. The most significant adjustment around the world, according to NOAA, is actually for temperatures taken over the oceans, and that adjustment acts to lower rather than raise the global temperature trend. The homogenization methods used have been validated and peer-reviewed. For example, a 2012 paper in the Journal of Geophysical Research confirmed the effectiveness of the homogenization processes for NOAA’s network of stations, and even noted that “it is likely that maximum temperature trends have been underestimated.” In other words, there may have actually been more warming than NOAA has reported. Berkeley Earth, a climate science nonprofit founded in early 2010 by scientists expressing skepticism at the time about global warming, has also found no undue manipulation of temperature data in its own analyses. 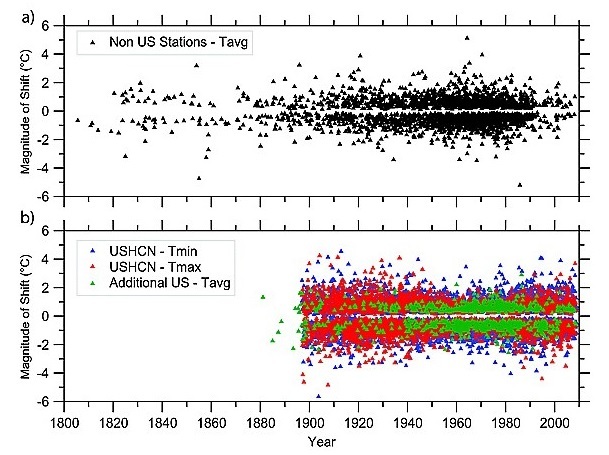 Its page specifically on the Paraguayan Puerto Casado station that Homewood mentioned shows the adjusted readings do in fact show a rise in temperature over time. An October 2011 paper in the Journal of Geophysical Research provides an overview of the entire Global Historical Climatology Network’s temperature data set, including detailed information about adjustments. In total, at least one “bias correction” was applied to 3,297 of the 7,279 stations in use at some point since 1801, though most of these occurred from the 1950s through the 1980s. As the chart below shows, there are approximately equal numbers of adjustments in the positive and negative directions. The supposed manipulation of data by East Anglia and other scientists in the Climategate affair also proved to be completely unfounded, as we have written twice before. Climate skeptics claimed that leaked emails between many climate scientists around the world showed there was a coordinated effort to inflate the global warming signal in temperature data. But several separate investigations, including by the U.S. Department of Commerce Inspector General and the Environmental Protection Agency, found no such wrongdoing or manipulation. According to one independent international investigation, known informally as the Oxburgh Report: “We saw no evidence of any deliberate scientific malpractice in any of the work of the Climatic Research Unit and had it been there we believe that it is likely that we would have detected it.” Palmer’s spokesman said the congressman had no comment on the repetition of this claim in spite of the repeated exonerations. Palmer’s claim that “we are building an entire agenda on falsified data” has no basis in evidence. Even as these claims of data manipulation have resurfaced, there is now a general consensus that 2014 was the hottest single year since temperature record keeping began. This same conclusion has been reached by NOAA and NASA, the Japan Meteorological Agency, and the World Meteorological Organization. The United Kingdom’s Met Office said that 2014 was among the warmest along with 2010, but it is impossible to say for sure that 2014 was hotter. According to NASA, nine of the 10 warmest years have all occurred since 2000, with 1998 the lone exception.